A three-member panel of financial experts is predicting state tax collections will grow by 3.3 percent next year. “There are so many unknowns out there with potential downsides that we want to be more on the cautious side than the exuberant side,” says Dave Roederer, the governor’s budget director and one of the three members of the state Revenue Estimating Conference. Since July 1, 2012, state tax collections are running nine percent ahead of last year’s pace, but Roederer says looming federal tax hikes and spending reductions mean state policymakers need to be cautious. Legislative Services Agency director Holly Lyons, another member of the panel that predicts state tax revenue, says the uncertainty created by federal policymakers is like a “big wet blanket” on the economy. David Underwood, a retired business executive from Mason City, says the economy is essentially frozen by the inaction in D.C. The decision Underwood and the two members of the Revenue Estimating Conference made today sets the upper limit for what legislators and the governor can spend in the coming year. The predicted 3.3 percent growth in state tax revenues will yield $222.7 million more for the state treasury. State Representative Chuck Soderberg, a Republican from Le Mars, will be chairman of the House Appropriations Committee when the legislature convenes January 14. He attended today’s meeting. “We’re going to start putting the numbers to pass a budget that we can sustain, with the uncertainty that we have,” Soderberg told reporters afterwards. 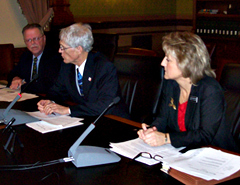 Senator Bob Dvorsky, a Democrat from Iowa City, is chairman of the Senate Appropriations Committee. In a written statement, Dvorsky said Iowa’s rising state revenues give lawmakers a chance to launch a “bipartisan effort to balance the state budget without raising taxes” and still make “investments” in K-12 schools and job training programs for adults. AUDIO of December 12, 2012 Revenue Estimating Conference meeting. The panel predicted 3.3 percent revenue growth in state fiscal year 2013, which begins July 1. The group set a tax growth estimate for fiscal year 2014 of 3.4 percent.